Spent a lovely evening in downtown LA at my favorite book store, The Last Bookstore. If you're in the downtown area, I highly recommend you check it out! Tons of books (new and used), records, and even an art gallery, it really is such a cool place to explore and discover new things. I left with a new record and two new books. What are some of your favorite ways to spend a Sunday evening? Looks like a great hang out for a Sunday! Loving the top and the bag.So cute. Hi Yuka! Love the powerful pattern in this vintage blouse, is totally your style! Loved how you combined it with those amazing boots! Love the top, so pretty on you dear. Such a cute spot- and your outfit was perfect! Love the sleeves on that blouse! Your bag is so cute. I loved! Your outfit is so beautiful and bag is so unique and gorgeous. 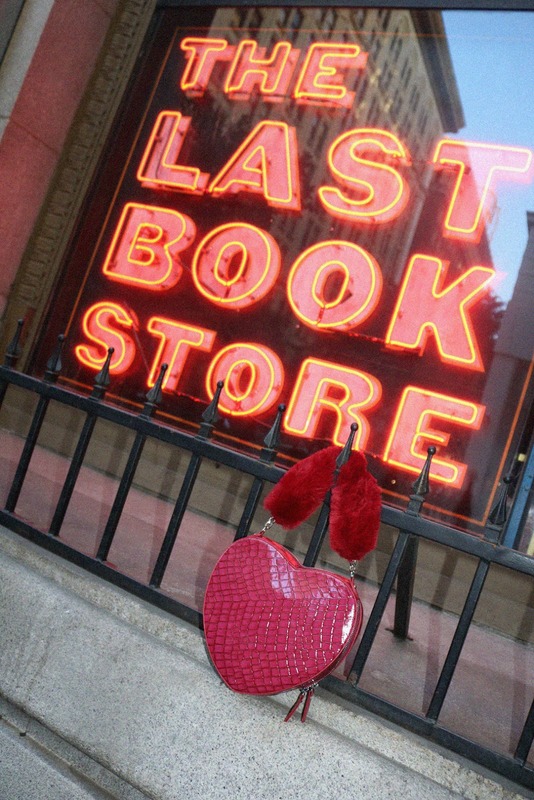 I really want to visit The Last Bookstore because it seems like very interesting place where I can spent hours.